Board of Directors meetings: January through October - third Wednesday of the month - 6:30pm - Jacksonport Townhall. November and December - no meetings. What does it take to plan Cherry Fest? A dedicated volunteer to be Cherry Fest Chairman. General responsibilities are to communicate with specific volunteers as to the organization of the event, hire entertainment, security and miscellaneous vendors for supplies, and to be available the day before the event for setup and the day of Cherry Fest. 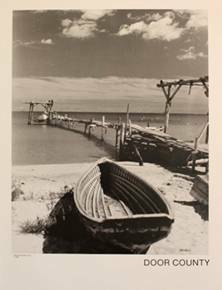 This image of Kohl's Dock in Jacksonport was photographed by Bayard Michael, and is offered by the Jacksonport Historical Society, Inc. as a fund-raiser for the development of our museum on the south end of Jacksonport. The site currently includes the Cote Cabin and the Loritz Log Home has been moved to the location. Bayard Michael died in 2010 in Jacksonport. He was a longtime resident. Bayard was an avid sailor and a renowned photographer who spent his career as a Patent attorney with Michael, Best, and Friedrich L.L.P. in Milwaukee. Bayard photographed many interesting views of Door County. 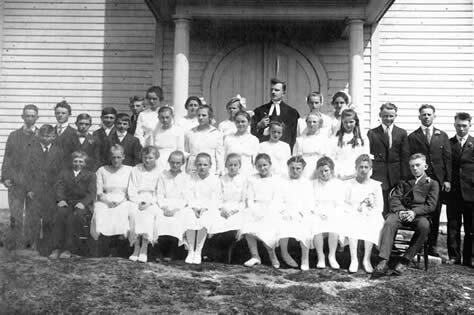 His family has made these photos available to the Jacksonport Historical Society. They will also hang in the Jacksonport Historical Society museum. For information on purchase of the poster, call Jo Wahlen at 920-823-2032. Price is $25 each plus shipping. Can you help us identify the people in these photographs? The first two pictures are from the August Tiedtke photo collection and appear to be confirmation photos. 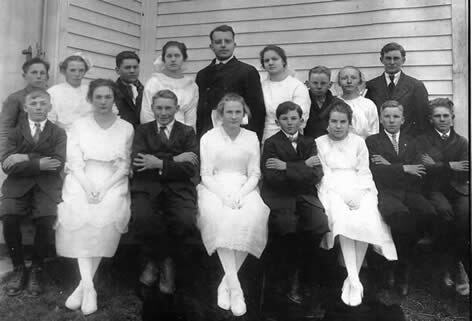 This photo is a school picture from the Butler family photo collection. See any familiar faces? If you recognize this photo or any of the faces please contact us via email at the above address.